Many visitors to Rocky Mountain National Park will make the trek up to Dream Lake from the Bear Lake trailhead. 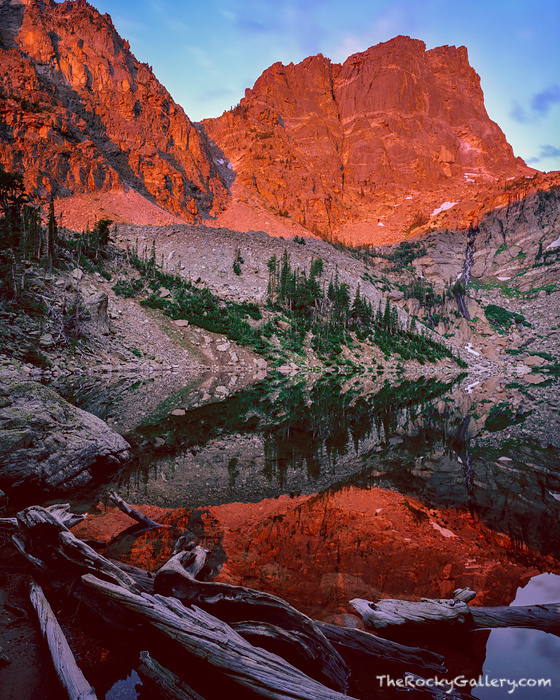 Once hikers reach Dream Lake, many stop and then make the return trip to Bear Lake. For those a little more adventerous, they can continue their hike above Dream Lake to equally as beautiful Emerald Lake. Emerald Lake is located just over a half a mile above Dream Lake and resides right at the base of the beautiful and imposing Hallett Peak. Because of its location, Emerald Lake is often accompanied by winds but this morning when I hiked up to Emerald Lake with my 4x5 inch large format film camera, I was blessed with perfectly calm condtions. There was no wind and the surface of Emerald Lake was perfectly still as the first golden rays of sun illuminated Hallett Peak. Photo © copyright by Thomas Mangan.